In the first couple of decades of Walt Disney World many of the most memorable images from Walt Disney World came from a unique perspective. Rather than a straight forward take on the subject matter, such as attractions or resorts, the photographs were taken from the air. Aerial photographs and fly-overs, such as the famous Mickey on top of Spaceship Earth, were a mainstay of advertising and press photographs. They haven’t totally vanished, but these pictures are not nearly as common today, though not for lack of wishful thinking (who wouldn’t love a photograph over Kilimanjaro Safaris’ savanna?). Scrutinizing these eye-in-the-sky images offers an amazing amount insight into the early years of Walt Disney World. What was there, what wasn’t, a literal footprint of how things were laid out. 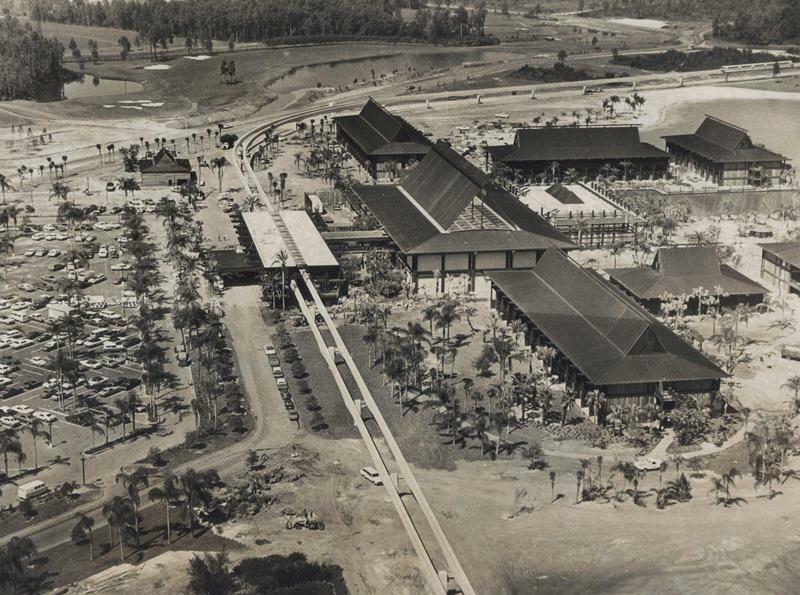 Here’s just one such image, from just before the Polynesian Village opened in 1971. I noticed a pair of helicopters hovering around on the outer edges of Epcot and MK on Dec 16th 2011 while we watched Illuminations. I wondered if that was an official flight filming or do they do tourist flights?